By Hazel Chua on 01/11/13 • Leave a comment! The thought of someone tea-bagging the cup of tea you’re about to drink is just plain gross. In fact, it’s downright disgusting. That said, I wouldn’t mind it though if it were Mr. T who did the teabagging. Not because he’s a celebrity of sorts, but because of the fact that he is the actual tea bag itself. These hilarious Mr. 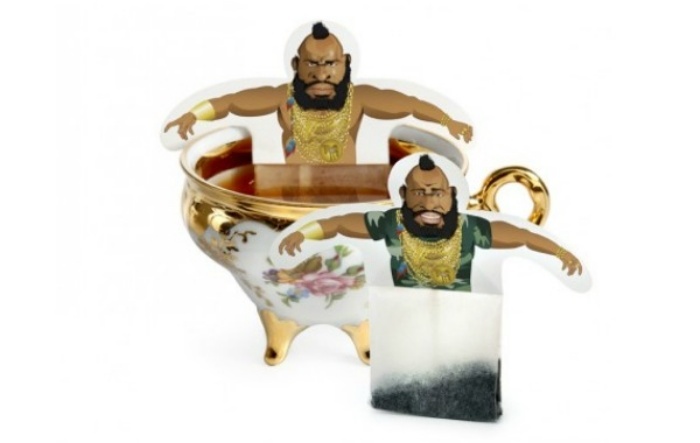 Tea tea bags let you unwind with Mr. T sprawled gregariously in your tea cup. Each set comes with two tea bags and a matching greeting card so you can give the gift of T-bagging to someone who truly deserves it. It should come as no surprise that Mr. T is extremely popular with the tea-drinking crowd, so it’s currently out of stock, but you can sign up to get notified when it becomes available again.